-For Darkness Shows the Stars by Diana Peterfreund: I've heard NOTHING but amazing things about this book! Am very excited to read it!! -Poison Princess by Kresley Cole: I hear Kresley Cole's books are very popular, I want in on this action. -The Son of Neptune by Rick Riordan: I haven't actually read the first book, but I LOVED the Percy Jackson series, so of course I'm book hoarding these. -Grasping At Eternity by Karen Amanda Hooper: this sounds fascinating! I'm always intrigued by reincarnation stories! -Ask Again Later by Liz Czukas: this sounds adorable! -Dear Killer by Katherine Ewell: this sounds SO CREEPY! -Uninvited by Sophie Jordan: OMG, ALL THE EXCITEMENT!! I've been waiting for this book FOREVER! (or it feels like it) It sounds AMAZING! -No One Else Can Have You by Kathleen Hale: isn't the title alone so creepy?? This sounds a little Pretty Little Liar-esque and YES I'LL READ THIS! -Elusion by Claudia Gabel: the dangers of submerging yourself in a virtual reality are endlessly fascinating to me! -Her Dark Curiosity by Megan Shepherd: OMG, I totally LOVED The Madman's Daughter!! SO excited for this sequel! -The House of Ivy & Sorrow by Natalie Whipple: there is witchcraft and a curse and OMG I'M SO IN! -Warrior by Ellen Oh: I really enjoyed Prophecy, the first book in the series, and I'm really looking forward to seeing what adventures Kira will go on this time! -Pretty Sly by Elisa Ludwig: I haven't read Pretty Crooked yet, but this series sounds so good with a girl that has the modern Robin Hood thing going on! -Panic by Lauren Oliver: SO EXCITED! LOVE LAUREN OLIVER! -The Heiress Effect by Courtney Milan: Courtney Milan is self-publishing her new series and I read one or two of her books before that I loved! -Great by Sara Benincasa: a retelling of The Great Gatsby, which I haven't actually read, but sounds totally amazing! -Gemini Rising by Eleanor Wood: an exclusive private school and Ouija bords. Seriously, do I have to say more? -Royal Inheritance by Kate Emerson: I'm slightly obsessed with Henry VIII and this book is about one of his illegitimate children. -Sometimes a Rogue by Mary Jo Putney: there is a rogue and racing across Ireland and kidnapping and YAYYY! -When The Marquess Met His Match by Laura Lee Guhrke: the heroine is a matchmaker who doesn't want to help the the hero find a match, of course this will be fun!! -The Strangled Queen by Maurice Druon: this series is being re-released and comes highly recommended by George R.R. Martin. -Forgive Me, Leonard Peacock by Matthew Quick: this sounds absolutely heartbreaking! -Things Good Girls Don't Do by Codi Gary: I really like the sound of this, but I'm not really a fan of the cover... She looks awkward. Heartbeat by Elizabeth Scott: I cannot imagine having your mother lying in a coma, basically being a baby incubator! I got a lot of the same e-galleys as you from Edelweiss, but didn't find Panic by Lauren Oliver, MUST GO find it now!! 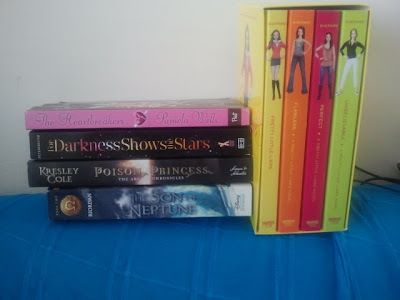 :-) I've wanted to read For Darkness Shows the Stars for awhile as well. And I read the first one before The Son of Neptune, but need to read on with that one! Great haul this week! I'm an old GFC follower. For Darkness Shows the Stars is a pretty good book; I assume you've read Persuasion, which it's based on ? I'm really looking forward to Diana Peterfreund's new book, Across a Star-Swept Sea, which is a sci-fi retelling of The Scarlet Pimpernel. Great looks amazing! I can't wait. Hmm....all of those are classic retellings. Interesting. I added a bunch of these to my wish list. I'm especially intrigued by the Gatsby retelling. Me too!! It sounds so good! Wow! This is a huge haul! You're going to love Pretty Little Liars. The show is different from the books but the books are just as fantastic. Also, PANIC!! I'm dying to read it. Hope you enjoy! I love the Percy Jackson series too! I've been reading the Heroes of Olympus series but I still need to read The Mark of Athena before The House of Hades comes out in October. I'm SO BEHIND on this series!! 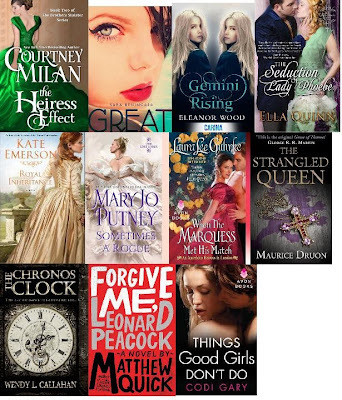 So many fantastic books! Perfect Lies, Dark Curiosity, and Uninvited!! I'm SO JEALOUS of those! Very cool! The Poison Princess is one I've had on my TBR list for a long time! It sounds really good. 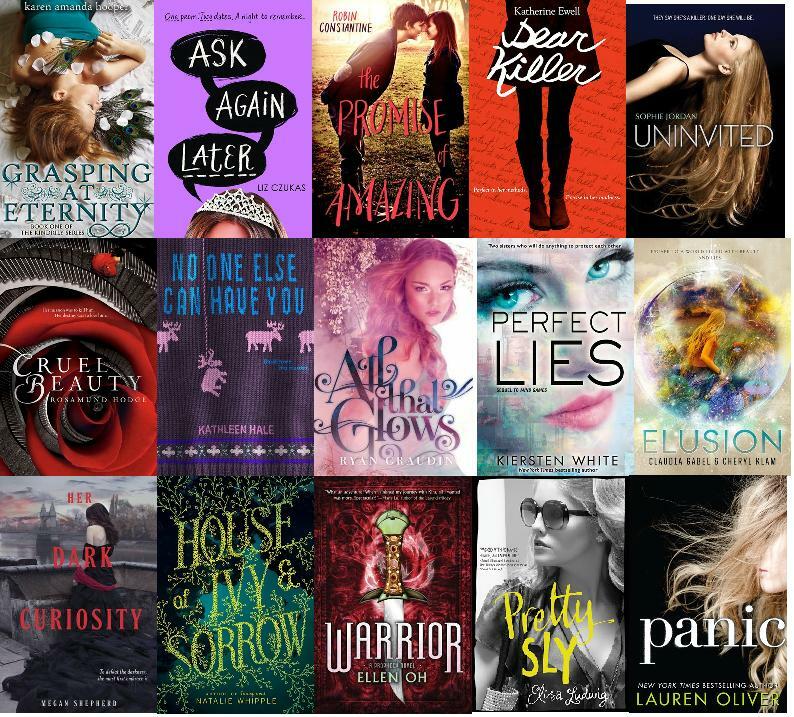 Happy reading all of these amazing books! Great haul!! I have heard so many good things about For Darkness Shows the Stars! Hope you enjoy everything! Wonderful haul! I need to get my very own copy of For Darkness Shows the Stars (since its a retelling of Persuasion, which is my favorite Austen novel!). Eek, I need to request egalleys for Dear Killer, Perfect Lies, and Elusion. The covers are gorgeous. And YES! Aren't the covers amazing?? Harper definitely has some of the best covers out there! Whoa, you got so many of the books I've been pinning over too! Have fun reading! UM....I saw some of the Harper stuff...squealled pretty fiercely oer CRUEL BEAUTY, actually! But...how did I NOT SEE both WARRIOR and PANIC on the list??? Just d/led both, ty for the tip!! YES CRUEL BEAUTY!! :D ALL THE EXCITEMENT! And I'm so glad you're excited for Warrior! Lots of people seemed to dislike Prophecy, but I really enjoyed it!